I'm at SC18 - the premiere international supercomputing event - in Dallas, Texas. Every year at this event, hundreds of companies and universities gather to show what they've been doing in the past year in supercomputing and HPC. As usual, the highlight of this event for me is the student cluster competition. Teams from around the world gather to compete on which team can make the fastest, most efficient supercomputer within certain constraints. In particular, the machine must be built from commercially available components and not consume more than a certain amount of electrical power while doing so. 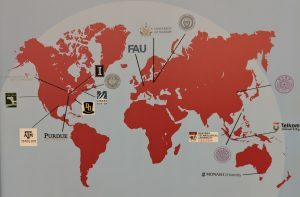 This year's teams come from Europe, North America, Asia, and Australia, and come from a pool of applicants of hundreds of universities who have been narrowed down to this list. Of the 15 teams participating, 11 of them are running their clusters on CentOS. There are 2 running Ubuntu, one Running Debian, and one running fedora. This is, of course, typical at these competitions, with Centos leading as the preferred supercomputing operating system. The teams are given a variety of projects to work on before they get here, and then there is one surprise project that is presented to them when they arrive. They have 48 hours to work on these projects, and the winner is selected based on benchmarks and power consumption. You can read more about the competition, and about the teams participating, on the SCC website.